The Art of Mobiles From Hotchkiss Mobiles. Unique Handcrafted Mobiles for All Locations Including Commercial, Residential, Outdoor Garden & Patio. Order a mobile for your open ceiling spaces and "enjoy the movement!" ... on this site you will discover our full line of Museum quality hanging mobiles for both contemporary and traditional homes, garden patios and modern office spaces. Hanging mobiles make a stylish addition to any home. 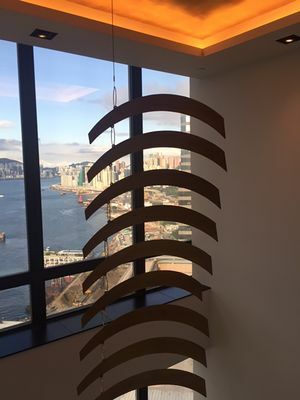 Display a quality hand-crafted hanging mobile created by nationally recognized mobile artist Joel Hotchkiss. • We Ship UPS daily nationwide and to Europe via USPO. Many of our mobiles are ordered as gifts and we will ship directly to the recipients. If you have any questions regarding our hanging mobiles please call us at 413-232-0200 or email us at info@artmobiles.com.